925 Agner Road Salisbury, NC. | MLS# 3371929 | Provident Living (704) 609-5362 - Jean Griswold - Your Trusted Real Estate Advisor - Call Jean for all of your real estate needs. $10,000 PRICE REDUCTION! 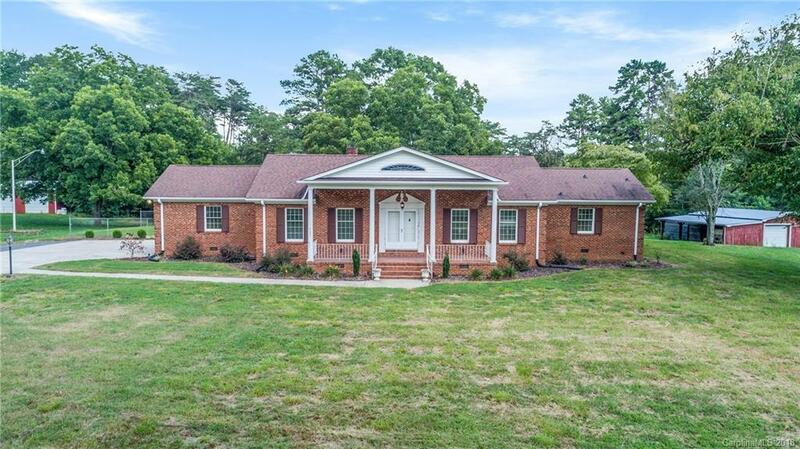 Country retreat w-750’ feet of road frontage; long driveway back to private colonial all-brick home w-stately columns & covered front porch. Wood-burning FP in great room; recessed lighting. EIK w-oak cabinets; recessed lighting. Front room c/b formal living rm or dining rm. Cozy sunporch w-broken tile floor. 3 bedrooms; 2 w-direct access to baths (could be 2nd master). Laundry room w-built-in cabinets & large office area. Finished garage. Roof, water heater, & vinyl trim replaced 2011; HVAC air compressor new 2012; septic system inspected & pumped 2012. Water stove in pump house can be used as secondary heating source (reducing electric bill). Two huge workshops–each has 3 rollup garage doors and a man door. 2-stall horse barn with lean-to areas. Acres of woods and pastures–could be leased out to farmers and hunters if desired. Spring in rear of property, under the big oak tree. Bankruptcy Estate property; acceptable offer can usually close within 60 days.